The Savvy Stamper: Critter Monday - Texture it! Good morning! I am starting to get in a winter/Christmas mood now. As soon as I can dig them out, I plan on playing my Christmas cd's. My hubby said he's ok with that as long as the decorations don't come out too, lol! That's ok, I'm wearing him down. When we first got married, he would just roll his eyes and say no way! It's Critter Monday! This week's challenge is to TEXTURE IT! Use fun flock, Liquid applique, Stickles, Liquid pearls, and Embossing powders, whatever to create texture. Our sponsor this month is Stamp and Create, and they have a lot of neat stamps and products. 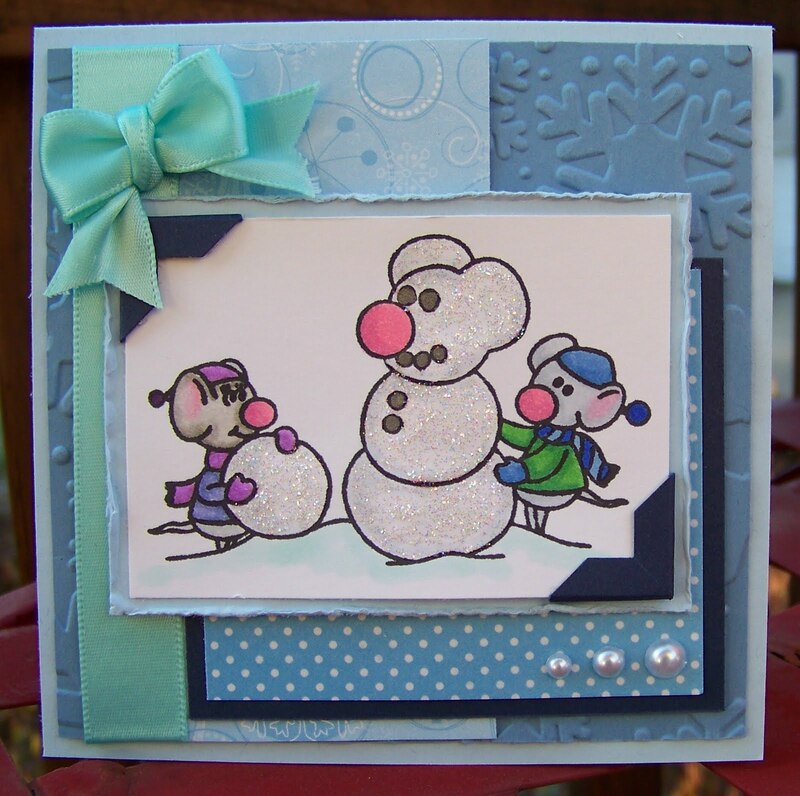 These cute little mice are from their store - this stamp is Frosty the Snowmouse by Kraftin' Kimmie stamps. Supplies are Kraftin' Kimmie image colored with Copics Star Dust Stickles for the snowman and snowball, Kaiser pearls from Paper Jewels, Sizzix embossing folder (snowflakes), Martha Stewart photo corner punch, and misc ribbon. DP is DCWV; cardstock is SU Bliss Blue, Night of Navy and Brocade Blue. awwwww....these lil' mice are too cute. Great texture! Aw, very cute! 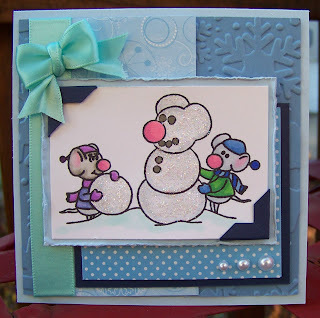 I love the glitter on the snowmen and the distressed edges. Just adorable! That mouse snowman is Thanks for glittering it up with Delightful Challenges.too funny! Too cute...I just love those mice and snowman! super cute card, Colleen! I love the glitter on the snowman (or would it be a snow mouse). fabulous DT post! So, so super cute, love this precious image. More super cute snowmen.. or should I say snowmouse this time!